Camping is lovely, save for getting bit up by bugs, sweating in the humidity and random, terrifying wildlife encounters in the middle of the night. 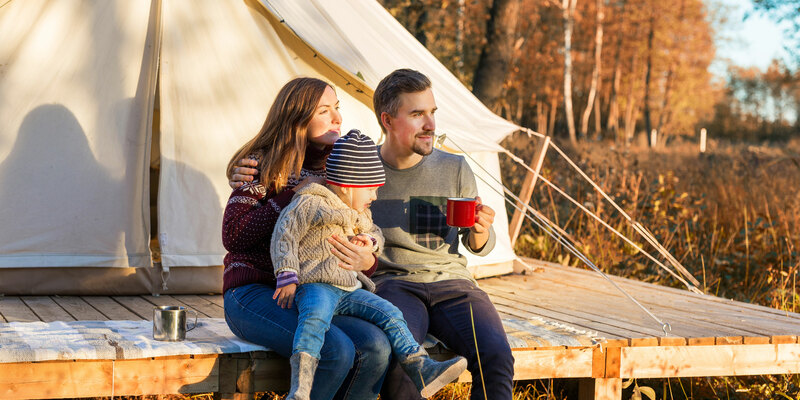 Instead of signing up for a sore back, book a comfortable—and in some cases, luxurious—camping experience with your family in the great outdoors. 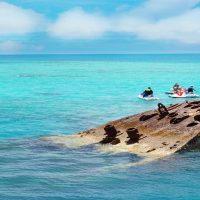 Here are 10 outdoorsy vacations for families who aren’t keen on camping. One way to bypass the discomfort of being on the ground in a sleeping bag is to rise high up into the sky! That’s literally what The Mohicans offers via its six stunning treehouses in central Ohio, two of which were designed by Pete Nelson, star of the Discovery Channel’s hit series Treehouse Masters. The majority of the treehouses sleep four in a bedroom and a loft, and all feature intricate wood construction and marvelous naturalistic touches such as the beautiful bridge from the hillside you’ll walk across to enter White Oak, the first treehouse of The Mohicans. All of the houses include linens, towels, full bathrooms and a private outdoor shower, heat and air conditioning. You will have all the creature comforts, minus a cell signal—but who needs that when you have the stunning Mohican Valley with which to connect! 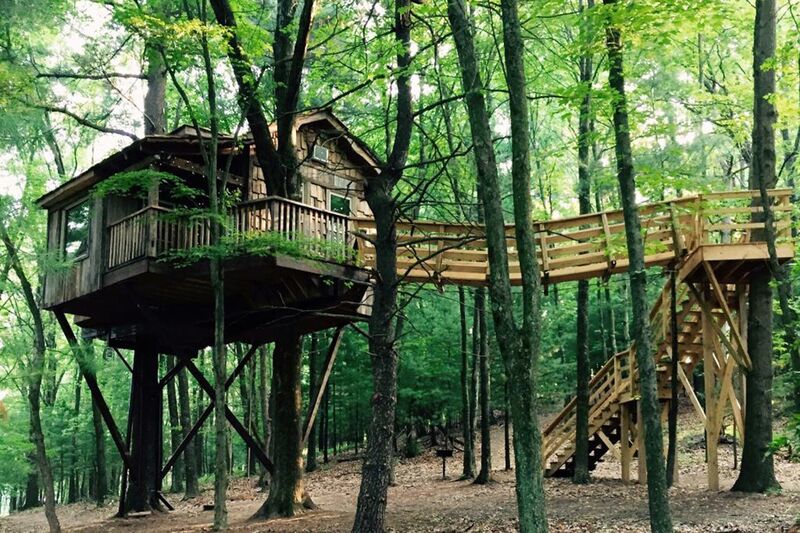 Related: 8 Most Magical Treehouse Hotels in the U.S.
Glamping doesn’t get much more glamorous than this darling property in the foothills of Virginia’s Alleghany Mountains. Choose to stay in a renovated authentic Norfolk & Western caboose, a genuine silver bullet 26’ Airstream Trailer with all the retro refurbished touches you can imagine, or an actual glamping tent complete with high-ceiling, chandelier lighting and best of all, your own fully-appointed private bathroom. The Deput Lodge offers families a true comfy alternative to camping and a dreamy backdrop to make your Instagram friends and followers totally jealous. Related: 9 Coolest Airstream Hotels in the U.S.
As a general rule, all KOA cabins are a superb, comfortable alternative to camping. But the level of comfy varies from site to site. 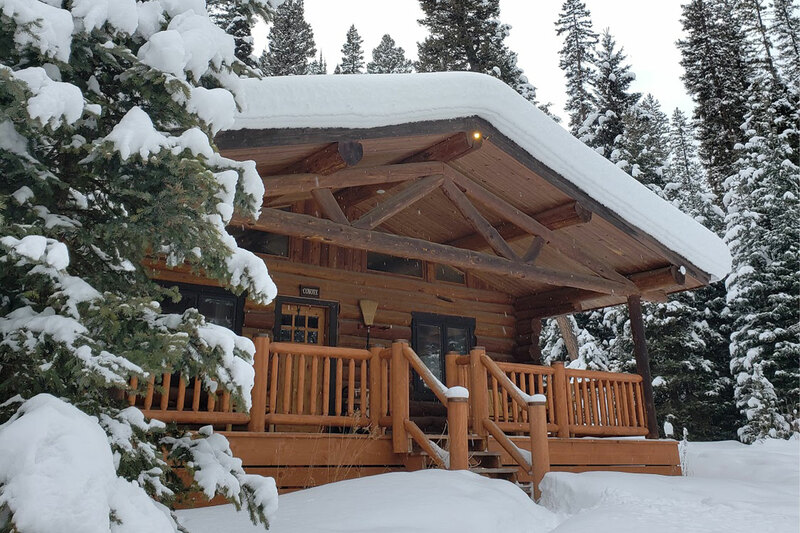 Located just a stone’s throw from the preferred west entrance of arguably the most glorious national park of the 61 in the National Park System is the home of huge, fantastic lodges perfect for a family vacation to Glacier National Park. The West Glacier KOA is a stellar site with a pool, a bevy of coin-operated laundry facilities, and charming bi-level wood cabins that will provide a stellar night’s sleep (with all the necessary linens, plates and silverware) before you get up to drive the Going-To-The-Sun Road and go for a hike. If you fancy your outdoorsy accommodations a little more dainty than rustic (raises hand), this darling batch of cottages just down the road from Mount Rushmore in Hill City, South Dakota, is your match Perfectly clean, elegantly appointed, and extremely comfortable, Whispering Winds Cottages will whisk you away to dream land and see you rise refreshed in the morning without any of the aches and pains typically associated with camping. 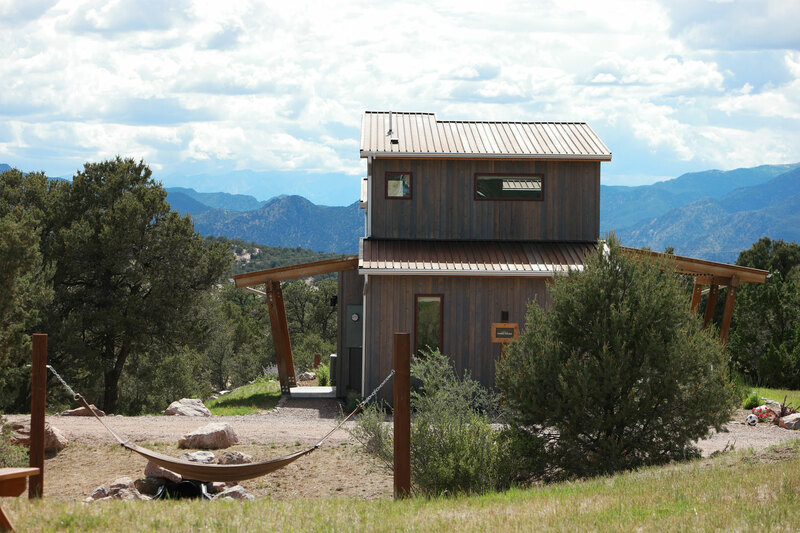 A neighborhood cluster of brand-new, deluxe bi-level cabins and evocative glamping tents highlight this superbly comfy alternative to camping in Cañon City, Colorado. The property’s restaurant is ready to serve three meals a day; a four-story ropes course and mini-golf are just across the street; and stellar whitewater rafting (Class I-IV available) through the picturesque Bighorn Sheep Canyon along the Arkansas River with expert guides of Echo Canyon River Expeditions is nearby and can be arranged by Royal Gorge Cabins. 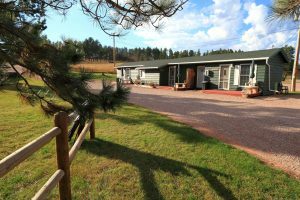 Whether you ride the historic Royal Gorge Route Railroad or on horseback into the Garden of the Gods, you will have a plush and luxurious cabin beneath the dark night sky to call home during your Colorado family vacation. Possibly the most luxurious camping-but-not-at-all-camping option in Montana is sandwiched idyllically between Big Sky and the West Yellowstone entrance of America’s first national park. Onsite are a slew of stunning log cabins, each appointed with fine amenities, huge four poster beds that are the antithesis of a sleeping bag on the ground, a record player with a stack of vinyl from the likes of Merle Haggard and Van Morrison, and bathrooms with heated tile floors. An hour south by car and you are in Yellowstone, and 20 minutes on a horse drawn carriage at Lone Mountain Ranch and you are enjoying Lone Mountain’s famous sleigh ride dinner in a candlelit cabin set among towering conifers. This place is magic—comfortable, outdoorsy magic. 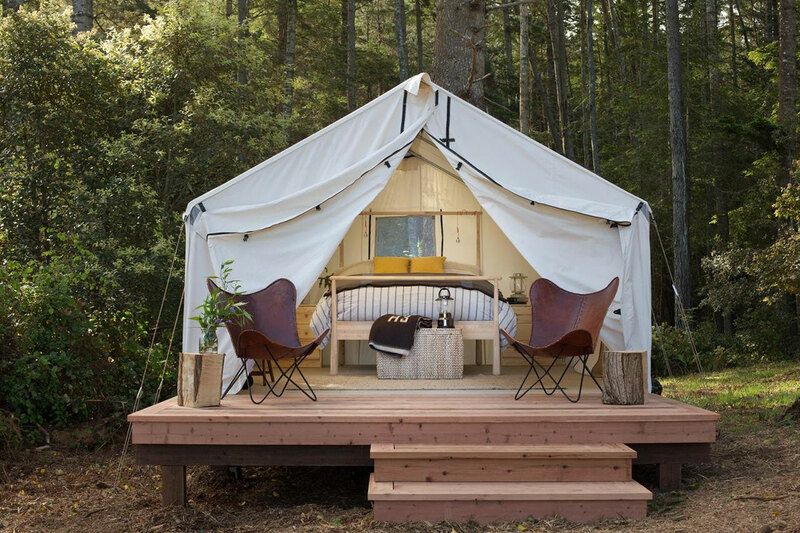 Located on the Pacific Coast, just 167 miles up scenic California Route 1 from the heart of San Francisco, is this upscale campground for those who want to ‘kinda’ rough it out in nature. 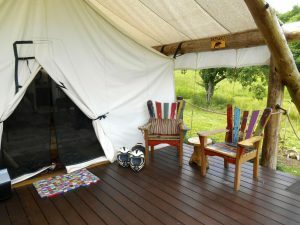 Stay in a tented cabin and sleep atop a comfy bed (with bunk bed for the kiddos!) during an outdoorsy NoCal retreat that’s minutes from redwood forests, an ocean beach, and the quaint village of Mendocino. Saturday morning yoga is offered on a redwood deck for just $10 and free guided weekend hikes with a local naturalist are the ideal way to ease your way into a new day at this glorious glamping site. Horse shoes, bocce ball and board games are available onsite, and a short stroll down to Big River leads to opportunities for kayaking, canoeing and mountain biking. If all of that sounds too strenuous for your family’s luxurious camping adventure, cozy up with a book or some much deserved shuteye in a hammock at Mendocino Grove. 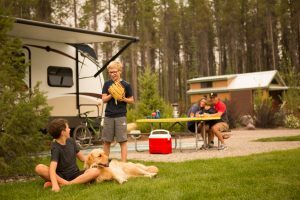 Situated north of Salt Lake City, on Bear Lake by Utah’s border with Idaho, is a one-of-a-kind alternative camping experience called Conestoga Ranch. 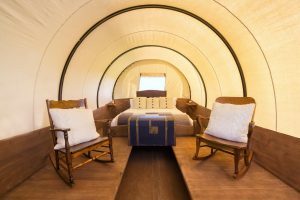 Your kids will never forget the time they spent a family vacation hitched up in an old fashion chuck wagon, in bunk beds beneath the canvas lid of a 19th-century style Conestoga wagon. During the day, take complimentary cruiser bikes out for a spin to see the sights, then wash off in the ranch’s bathhouse. It has luxurious rainfall shower heads, and is stocked with towels, shampoo, conditioner, and soaps. When the sun goes down, live the pioneer life 21st-century style with your kids in a circle of Adirondack chairs, among the picturesque wagons, making S’mores by a shared fire pit under the stars. Back in South Dakota, just above Sioux Falls, is another and an authentic (read: not glamping) covered wagon camping experience that will transport you back to the prairie days… with a bit more of the comfort and modern conveniences we expect today. The Ingalls Homestead is part living history museum, part prairie life ‘theme park’ with the chance to make a corn cob doll, drive a pony cart, play in a real one-room schoolhouse, learn hay twisting and wheat grinding, make a jump rope and clean clothes on a washboard! 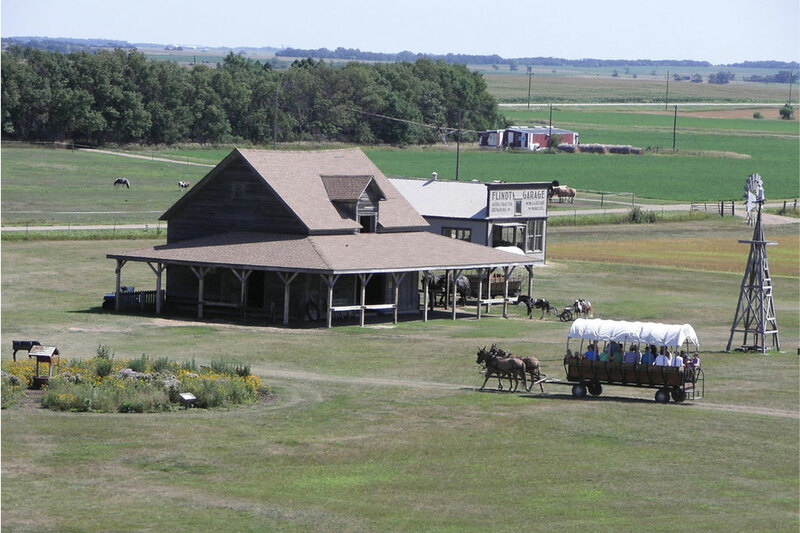 The 1880’s life comes alive again for around $60 a night in eastern South Dakota. 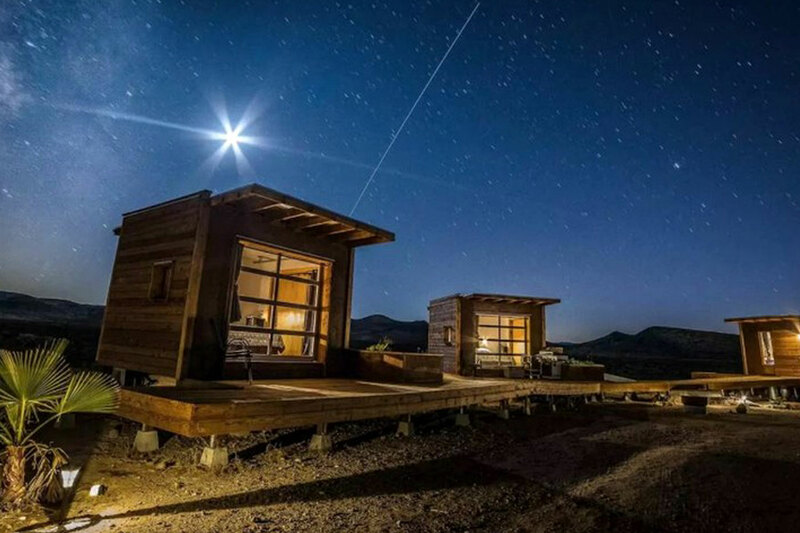 This set of three secluded, comfy camping eco-pods are the best way to experience the magnificent night sky above the Mojave Desert in California, devoid of all light pollution. Small, charming, totally Instagram-able and WITH a private bathroom, each unit features comfortable beds, linens, and TVs with digital antennae, not that you’ll need it—because the best show to watch is on 24/7 just outside your pod’s huge windows. An epic and comfy desert camping adventure awaits you and your family!